I have always seen something in Bruce Ricketts. This guy has a natural gift and feel for cooking that is beyond skill. His hunger and passion for his craft clearly makes him one of the most exciting chefs in Manila today. And I was quite fortunate to have been asked to write his profile for this month’s Preview Magazine. Sensei Sushi was the place that got him attention. But moving his omakases over to Mecha Uma, in partnership with the Moment Group, now gives his food the appropriate setting and environment; and it is well deserved. It was quite the experience being behind the scenes; I had squeezed in conversations with Bruce over a couple of shoots. And boy is it hard to keep up with him. I understand a little better where all these ideas on the plate come from. But the best part was that I got to sample more of his cooking. 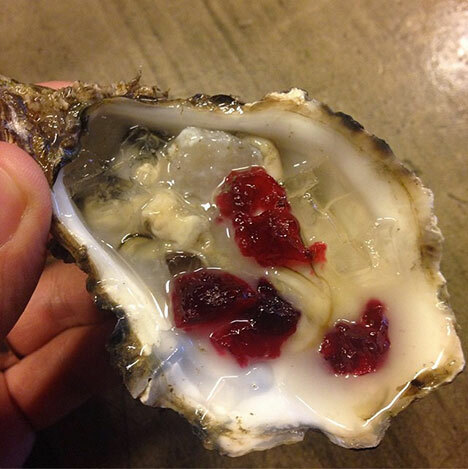 As this French Silver Scale oyster with sake gel and hibiscus jelly among others. 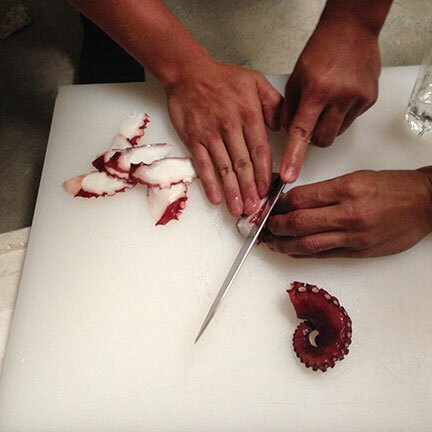 He’s just a generous soul and would not think twice about offering and slicing on-the-spot some Pacific octopus for everyone to try after a day on the set. Get your copies of Preview now to read more about Bruce’s story, his new baby Mecha Uma, and how he might actually get some international list makers’ attentions to give the Philippine creative dining scene a serious look.